Advantages of diaphragm seals in chemical manufacturing, petroleum refining, and a host of other process-based industries, you frequently use a myriad of harsh elements. How can you properly monitor your operation if hot, viscous, or corrosive chemicals can cause your gauges to fail or destroy them altogether? Fortunately, WIKA Instrument, LP has developed an assortment of measures that protect your gauges, ensuring accuracy, reliability, and peace of mind for many years to come. The diaphragm seal is your first line of defense against harsh production conditions. This added layer of protection keeps process media from reaching — and possibly getting inside — sensitive instrumentation. Diaphragm seals prevent gauges, switches, and transmitters from clogging or corrosion and, ultimately, failure. In applications involving heat, a diaphragm seal can be designed with a cooling element to protect the gauge from extreme heat. Installing a diaphragm seal with a capillary line facilitates the remote reading of a pressure instrument. Need more protection? WIKA’s All Welded System (AWS) permanently welds together a gauge and a diaphragm seal for use in especially harsh environments. 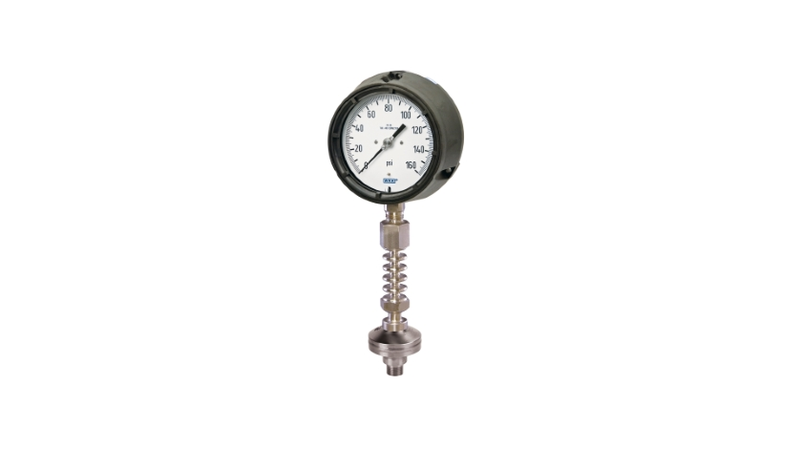 This feature is available on new gauges or as a drop-in retrofit on existing instruments. The AWS design eliminates threaded connections, which, in turn, helps eliminate any potential leak paths. This permanently sealed design eliminates even the potential for leakage, as might occur if the line experiences a sudden spike in pressure. Another key advantage of the AWS is tamper resistance, which is an important consideration in ensuring the accuracy of information. A gauge that has been altered in some way is very likely to provide inaccurate readings. The tamper-resistant design of the AWS eliminates any chance of gauge tampering. Process attributes. Is your process subject to temperature extremes? Is the process media corrosive, viscous, abrasive, or even toxic? Does it contain suspended solids? All of these elements influence your choice. Compatibility. It is not likely to happen, but a diaphragm seal can rupture. Accordingly, the fluid that fills the gauge must be chemically compatible with the process fluid. Other important considerations. These include the transmitter sensor range, mounting position, and regulatory requirements for your overall operation. Whether you choose a standard diaphragm seal or combine it with an All Welded System design, your operation will see some key paybacks. These measures of protection will ultimately reduce equipment downtime, improve safety, and control emissions. Over time, you will enjoy increased reliability and longevity, enhancing the return on the investment in your gauges and instrumentation. Want more details? Download a copy of WIKA’s Diaphragm Seal Solutions brochure, which outlines the many different options available to meet your needs. Or contact WIKA for information and guidance in choosing the right instruments for your application needs. For the most part of my professional career (30 years plus) I was involved in design, production and applying pressure systems involving diaphragm seals. In particular the application of this technology is part of my expertise. In a lot of industrial manufacturing diaphragm seals are helping in difficult measuring solutions. Particular corrosion and temperature problems can be supported with this technology. The variety of tasks and issues are endless in upstream, downstream, sanitary, power and food processing among others. Specification details, supporting documentation and industrial standards on a global basis allowing a wide variety of support. An overall knowledge about pressure gauge in general and particular pressure instrumentation such as process transmitters is required in order to design practical solutions. Demonstrating these duties for our customers is my commitment and challenge on a daily basis. When Should You Use Diaphragm Seals?